In conjunction with National Travel and Tourism Week, AIANTA announces release of "American Indians and Route 66"
Albuquerque, New Mexico (May 5, 2016) - Today, the American Indian Alaska Native Tourism Association (AIANTA), in partnership with the National Park Service Route 66 Corridor Preservation Program, announces the release of the "American Indians & Route 66" guidebook and accompanying website (www.AmericanIndiansAndRoute66.com), a first-voice interpretation of America's most famous highway. Route 66 is known throughout the world for the countless nostalgic tales connected to its history and iconic pit stops from Chicago to Los Angeles. The highway's most culturally significant and meaningful stories, however, have gone largely untold for nearly 100 years. With more than 1,300 miles of Route 66 located within Indian Country, the American Indians and Route 66 project's objective is to introduce the tribes living along the route, while educating the public and pointing the way to genuine cultural experiences. "Through oral history, first person accounts, and direct input from participating tribes, this project tells important aspects of 20th century tribal history, enriching the understanding and experiences of Route 66," said Kaisa Barthuli, National Park Service Route 66 Corridor Preservation Program. AIANTA, with Cherokee travel writer Lisa Snell, traveled Route 66 from Chicago to LA, creating a one-of-a-kind tour guide that brings American Indian voices and an untold perspective to the historic highway. According to the guidebook, throughout its history, Route 66 has guided travelers through the lands of more than 25 tribal nations. As detailed in the book, in the past American Indian stereotypes were propagated and used as a major lure for tourists on this "Mother Road" of American highways. 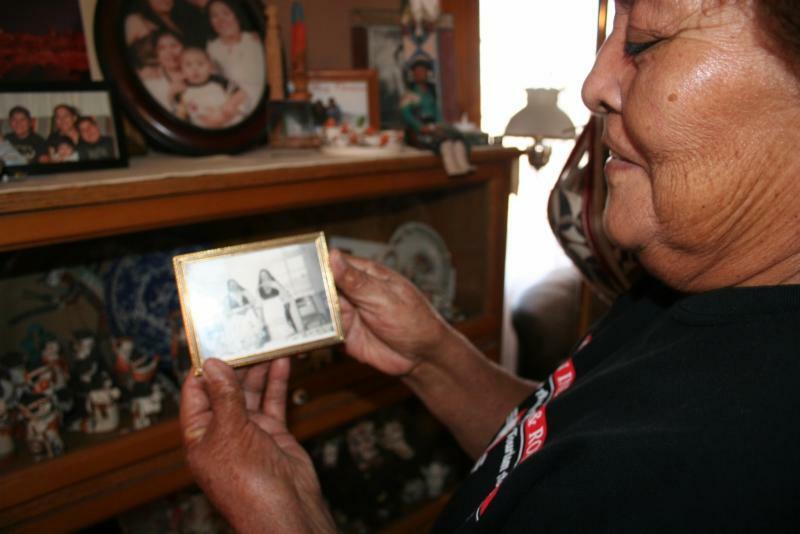 Pueblo of Acoma elder Mary Lowden holds a photo of her mother and her aunt, both pottery makers. As a girl, Mary and her sisters would walk down to the highway to sit at the general store and sell the pottery they helped make. "Tribes like mine that were affected by Route 66 can now provide the authenticity which will greatly enhance the traveler's experience and further tribal economic development," said Emerson Vallo, Pueblo of Acoma, New Mexico. Tribes and pueblos along the route that participated in this project include Quapaw Tribe of Oklahoma, Miami Tribe of Oklahoma, Cherokee Nation, Muscogee (Creek) Nation, Euchee (Yuchi) Tribe, Sac and Fox Nation, Iowa Tribe of Oklahoma, Wichita and Affiliated Tribes, Cheyenne and Arapaho Tribes, Pueblo of Sandia, Pueblo of Isleta, Pueblo of Laguna, Pueblo of Acoma, Navajo Nation, Hopi Tribe, Hualapai Tribe, Fort Mojave Indian Tribe, San Manuel Band of Mission Indians and the Gabrielino-Tongva Tribe. www.AmericanIndiansAndRoute66.com features an online version of the guidebook, downloadable for free. To learn more about the American Indians and Route 66, visit www.AmericanIndiansAndRoute66.com. For ordering information, contact the AIANTA office at 505-724-3592 or sbowman@aianta.org. To learn more about AIANTA, visit www.AIANTA.org. To learn more about the National Park Service Route 66 Corridor Preservation Program, visit https://www.nps.gov/orgs/1453/route-66-corridor-preservation-program.htm.